Nova Scotia has over 300 years of mining experience, supplying more than 20 different mineral products to domestic users and export markets around the world and it remains an important component of the provincial economy. Nova Scotia boasts competitive advantages over many global jurisdictions, including our extensive infrastructure that includes roads, railway, mobile communication, access to global markets via international air service, and deep-water, ice-free ports. Nova Scotia is and will continue to be a solid player in mining with its inherent advantages and we continue to build on that success as we build on investment and trade opportunities. The mineral industry in Nova Scotia is dominated by the production of industrial minerals and structural materials. The province produces gypsum, anhydrite, salt, coal, aggregate, limestone, silica sand, quartz, dimension stone (marble, slate, sandstone, granite) and peat. Production of commodities such as coal, salt, anhydrite, limestone and silica sand have remained relatively consistent in recent years. Nova Scotia hosts more than 60 historical gold districts. Current gold prices bode well for companies exploring in the province’s many gold camps. There are 10 advanced gold properties in Nova Scotia with an estimated total gold inventory of more than 4 million ounces. Recent coal production has occurred at several surface ′reclamation mining′ projects where previously mined deposits are being ′re-mined′ and the impacted lands reclaimed to modern environmental standards. This accounts for more than 500,000 tonnes of current coal production in the province. Salt production is thriving in Nova Scotia, averaging approximately 1 million tonnes per year of rock salt. Most of the salt is used for de-icing, but 175,000 tonnes are processed annually into food-grade products, including table salt. Gypsum mining was one of Nova Scotia′s most consistent industries for more than 100 years. The province produced approximately 80% of the total Canadian gypsum production, and 6% of world gypsum production. Nova Scotia is known for the quality and size of its gypsum deposits and is home to the world′s largest open-pit gypsum mine at East Milford. Diane Webber, P. Geo. Industry Liaison Geologist with the Department of Energy and Mines says, "The Province of Nova Scotia provides clarity and timely service to mining companies doing business through accessible and free geoscience expertise, regulatory coordination and a state-of-the-art map-based internet mineral rights registry." To further assist prospecting and junior exploration industries, the Department of Energy and Mines has implemented a Mineral Incentive Program which supports both grassroots exploration programs and advanced projects. Nova Scotia is committed to promoting exploration leading to mineral discoveries and new, producing mines. The combination of its rich natural resources, a deep talent pool, and extensive transportation infrastructure make Nova Scotia a mining sector goldmine. Find out more about mining business opportunities in Nova Scotia here. 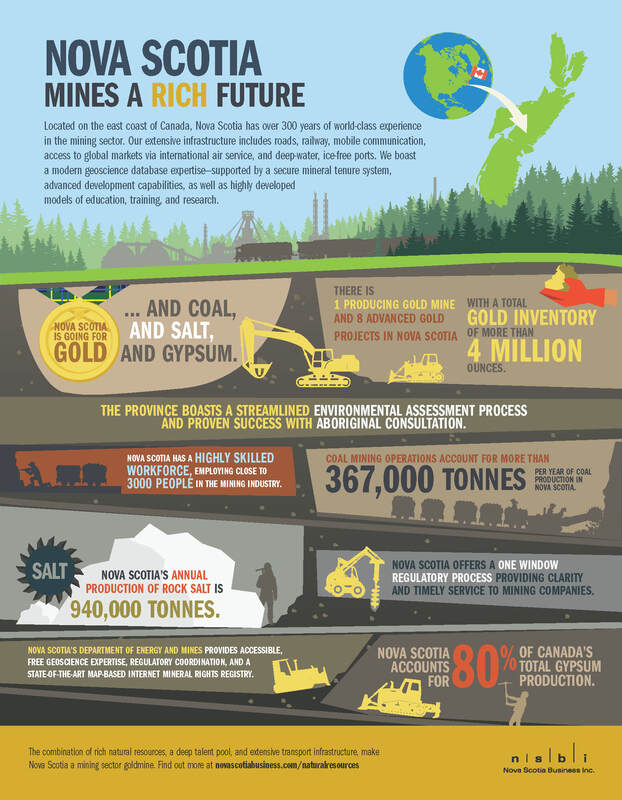 View the full Nova Scotia Mining Infographic PDF.